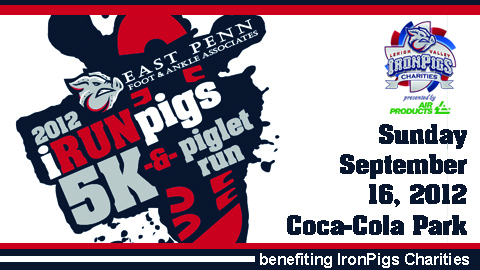 East Penn Foot and Ankle Associates is proud to announce that they are the title sponsor for the 2012 i-Run Pigs 5K and piglet Run Sunday, September 16 at Coca Cola Park in Allentown, PA. This is the first 5K hosted by the Iron Pigs and East Penn Foot & Ankle and all proceeds will benefit Iron Pigs Charities, a non-profit organization striving to provide educational and recreational opportunities for children in the Greater Lehigh Valley area. The i-Run Pigs 5K is open to teens and adults and the Piglet Run is open to kids 12 and under. Everyone who registers for the 2012 i-Run Pigs 5K and piglet Run receives a commemorative t-shirt, chip timing with your results delivered via text message, pre-race and post-race live entertainment and an entry in an Iron Pigs memorabilia raffle. T-shirts are available only to those who register before September 6. There will be additional prizes for overall male and female winners in each age group. Go here for more information on the race, walk and piglet run.